We're not in Kansas anymore: 'The Good Place' takes the yellow brick road to philosophical salvation – AiPT! We’re watching a crypto retelling of The Wizard of Oz. A little late to the game, I just discovered — and binged both seasons of — NBC’s sitcom The Good Place. And something hit me during the opening scene of Season 2’s “Best Self;” I’m watching a crypto retelling of The Wizard of Oz. I’m hardly the first to figure this out. And “Best Self” is probably the episode that most spells it out, with nods like the hot-air balloon, a reference to “Dr. Oz,” Jason ending his meandering story about one of his experiences in life by saying “it was all a dream,” and Michael echoing a famous Oz theme by saying the “Good Place was in the Bad Place all along.” Vulture also picked up several other subtler Oz homages. Okay, most of the characters in The Good Place almost perfectly correspond to Oz characters. Eleanor is Dorothy because we’ve repeatedly seen her, throughout her life, always run away from any group she’s been welcomed to join. Unbeknownst even to her, deep down, Eleanor is searching for her tribe, a community or family that will accept her for who she is, someplace she feels she belongs… a sense of home. But her Shrek-like neuroses have always driven her to preemptively reject any group that would have her as a member before they have a chance to reject her. Chidi is the Cowardly Lion because he’s so hyper-aware of how his actions could lead to theoretical, unintended, negative consequences that he’s afraid of everything — even the very act of making any decision, no matter how small. In life, Tahani behaved as a model philanthropist, but it was all a lie because, though her actions made a positive impact on others, they were motivated entirely by superficial and selfish reasons. Like the Tin Man, Tahani’s problem is her heart was never in it. Jason is the most blatant. A complete idiot, Jason lacks a brain. Michael might have initially appeared to be more of the Glenda of the series but the revelation made at the end of Season 1 that he’s a fraud — as well as his hot-air balloon to salvation — makes a convincing argument he’s The Wizard. Besides, a case could be made that Janet is The Good Place’s true Glenda. The denizens of Michael’s sham “Good Place” feel a bit like the inhabitants of Munchinland, ultimately left behind as the gang begins their quest to see the Wizard, or a Judge to decide the fates of their immortal souls. Finally, Season 2 ends with Eleanor alive once more. And, much like Dorothy waking from Oz, Eleanor is beginning to find those she knew somewhere else in this world. But why all the Wizard of Oz references? And to what end? While an undergraduate at New York University, I took a class called “Individuals and Society,” a kind of introduction to Philosophy and Political Science rolled into one. My professor, James Colaiaco, posited an interesting interpretation to The Wizard of Oz, where the Yellow Brick Road represented the 8-Fold Path of Buddhism. He likened the Oz characters discovering they possessed that which they sought the whole time to the teachings of the Buddha. But The Good Place has mostly finished its Oz narrative and, I suspect, will begin a new phase to the story in Season 3. Eleanor has awoken from her Oz. And, while her three companions failed their tests in the Season 2 finale “Somewhere Else,” she passed hers, proving her own moral growth. Last we saw her, she was well on her way to proving she could become a better person in life without even any memory of her afterlife experiences. So where does the show go from here? For two seasons, The Wizard of Oz narrative served an effective foundation for a story about personal character growth for individuals. But it doesn’t explore the larger philosophical questions about society as a whole. Sure, Cheedi’s obsession with the Kantian Categorical Imperative has clear implications for broader society beyond the individual. But it only scratches the surface regarding how to structure a better society. Eleanor and the rest of “Team Cockroach” may soon be given the opportunity to try their hands at designing a better “Bad Place” as the show transitions away from the individual and towards an examination of society. If ever there were a series suited to exploring concepts like John Rawl’s “Veil of Ignorance” thought experiment, it’s this one. 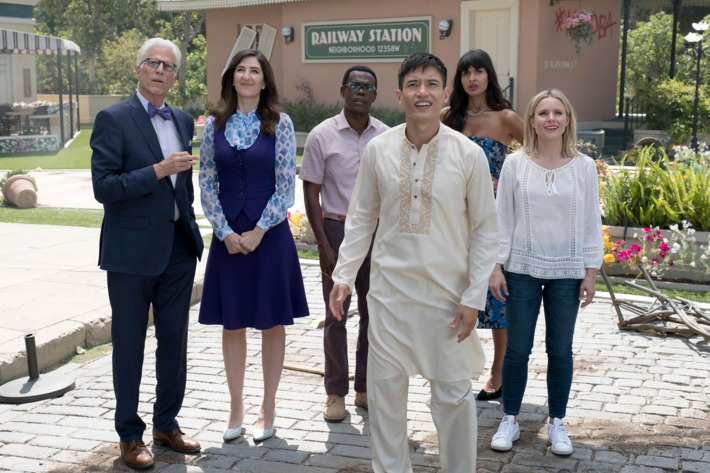 The Good Place has already set up the idea of society-building with Michael, the literal experimental architect of the faux “Good Place” that served as the series’ setting for the first two seasons before we saw it all be dissolved into oblivion at the end of “Best Self.” Could Eleanor, Chidi, Tahani, and Jason become the architects of the next afterlife experiments? If so, the smart money is on Jason’s version of Hell somehow involving Blake Bortles and the Jacksonville Jaguars. Scooby Doo vs. Ghost Hunters — Who are the better paranormal investigators?